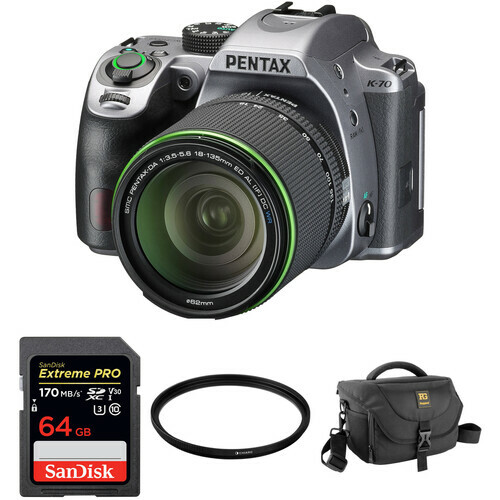 Comprising the essentials needed to begin shooting, the silver K-70 DSLR Camera with 18-135mm Lens and Accessories Kit from Pentax bundles the camera body and versatile wide-to-tele zoom with a memory card and a 62mm UV filter. Combining an advanced feature-set with a compact form factor, the silver Pentax K-70 is a sleek DSLR characterized by its multimedia capabilities, penchant for low-light shooting, and durable construction. Revolving around a 24.24MP APS-C CMOS sensor and PRIME MII image processor, this camera is capable of continuous stills shooting up to 6 fps and Full HD 1080p video recording, and has a broad sensitivity range up to ISO 204800. The sensor's design also omits an anti-aliasing filter, in order to gain greater sharpness and resolution, but benefits from a unique Selectable Anti-Aliasing Filter function that vibrates the sensor itself in order to mimic the moiré-reducing effects of a filter. The sensor-shift mechanism also enables Shake Reduction image stabilization, to minimize the appearance of camera shake, and Pixel Shift Resolution, to composite sequential exposures in order to gain increased detail and resolution. Complementing the imaging capabilities, the K-70 is equally refined in regard to handling and design, and features a dust-, freeze-, and weather-resistant construction for working in trying conditions. A large 3.0" 921k-dot LCD is available, and features a vari-angle design to permit working from high and low angles, and a unique Night Vision setting can be used to produce a red-colored display in order to maintain night-adjusted vision when working in dark settings. Additionally, built-in Wi-Fi permits wireless image sharing and remote camera control from a mobile device, and the K-70 is also compatible with the optional O-GPS1 GPS Module for geotagging and AstroTracer functions. Included with the camera body is the smc Pentax DA 18-135mm f/3.5-5.6 ED AL (IF) DC WR lens, which provides a 27.5-207mm equivalent focal length range, covering wide-angle to telephoto perspectives to suit working in a broad variety of situations. The lens construction integrates aspherical elements to help minimize spherical aberration as well as improve image sharpness. An SP (Super Protect) coating has also been applied to elements to help repel dust, water, and grease and the lens body is built to the same weather-resistant standards as the K-70 for use in inclement conditions. A 24.24MP APS-C CMOS sensor pairs with the PRIME MII image processor to realize clean, high-resolution still image quality, a sensitivity range of ISO 100-204800, and the ability to record Full HD 1080p video. The processor and sensor combination also affords a range of continuous shooting capabilities, including a 6 fps shooting rate for up to 40 consecutive JPEGs, 10 raw/DNG frames, or 8 raw+JPEG exposures. A unique and innovative mechanism allows you to toggle an anti-aliasing filter effect either on or off, providing support for both the high-resolution abilities of a filter-less design as well as advanced moiré protection. With the filter in the Off position, the camera is more prone to acquiring maximum sharpness, resolution, and detail from an image for the highest attainable image quality. When the filter position is set to either Type1 or Type2, an anti-aliasing simulator applies microscopic vibrations to the image sensor unit during exposure; working to create the same effect as an optical anti-aliasing filter. Having both options available extends the camera's versatility and allows personalized selection of the benefits best-suited to individual applications. Additionally, AA filter simulation settings can also be bracketed for times when the likelihood of moiré is unknown. In-camera sensor-shift type Shake Reduction (SR) works to minimize the appearance of camera shake for sharper handheld shooting with any mounted lens. This is ideal for working in low-light conditions or with longer lenses and, since the image stabilization is located within the body, both past, legacy lenses as well as current Pentax lenses receive the benefits of SR. The sensor-shift image stabilization goes on to benefit other camera functions, including the AA Filter Simulator function as well as Pixel Shift Resolution and Diffraction Correction. Pixel Shift Resolution technology composites sequentially recorded stills while shifting the image sensor in one pixel increments in each direction after each exposure in order to increase the effective resolving power, reduce noise, and achieve a more refined color palette. This mode is further enhanced with Motion Correction, which makes it possible to photograph moving subjects without artifacting or ghosting while still reaping the high-resolution benefits of Pixel Shift Resolution. Similarly, a Diffraction Correction function minimizes the effects of diffraction and other aberrations common to working with smaller aperture sizes. This technology is possible due to the heightened processing capabilities of the PRIME MII engine, and can also be applied to imagery during in-camera raw file development. The SAFOX X autofocus system employs 11 distinct phase-detection points, including 9 cross-type sensors in the center, to quickly and accurately acquire focus on subjects in a variety of lighting conditions down to -3 EV. Also benefitting autofocus performance, the 77-segment exposure metering sensor, light source sensor, and AF assist light help to further refine the focusing accuracy despite working in challenging situations. When shooting video or working in live view, a Hybrid AF system is employed that blends both on-sensor phase-detection and contrast-detection focusing methods for quick and accurate results. Face Detection, Tracking, and selectable AF points are also available for refined control, along with focus peaking to benefit manual focus operation. Full HD 1920 x 1080 video recording is supported in multiple frame rates, including 60i, 50i, 30p, 25p, and 24p, in the high-quality H.264 format. HD 1280 x 720 video is also supported in 60p and 50p frame rates. Audio can be recorded along with video using the built-in stereo microphone or, additionally, a 3.5mm microphone terminal is available for use of an external mic. Beyond standard movie recording, an interval timer can also be used for making time-lapse sequences, which can be saved simply as stills or files can be recorded at 4K resolution (3840 x 2160) and compiled into a Motion JPEG file for seamless playback. The interval timer allows you to record up to 2,000 consecutive frames with an interval of 2 seconds to 24 hours between each frame, and a 2 second to 24 hour time delay available. The 3.0" 921k-dot LCD monitor features a vari-angle design to better facilitate working from high and low angles, and also can be closed with the screen facing inward for increased protection. A unique Night Vision setting can be used to produce a red overlay on the LCD in order to maintain your night-adjusted vision when working in low-light conditions. Alternatively, an Outdoor View setting is also available to increase the brightness of the screen for greater visibility in sunlit conditions. Aside from the LCD, a 0.95x pentaprism optical viewfinder is also available, and affords 100% frame coverage for accurate composing. Durable body construction is both dust- and weather-resistant for use in trying conditions, as well as cold temperatures down to 14°F. The focal plane shutter can achieve shutter speeds up to 1/6000 sec. and also supports making bulb exposures ranging from 10 sec. to 20 min. A customizable control panel along with configurable function buttons, user modes, and presets allows you to setup the camera according to your specific shooting needs. The included D-LI109 lithium-ion battery provides approximately 480 shots per charge. Built-in Wi-Fi works in conjunction with the Image Sync app for wirelessly sharing imagery to a mobile device, as well as permitting remote camera control and live view capabilities from the smartphone or tablet. The K-70 is compatible with the optional O-GPS1 GPS Module to permit geotagging image files as well as use of the AstroTracer function to benefit taking photographs of the nighttime sky. The included zoom lens provides a 27.5-207mm equivalent focal length range to suit working in a wide variety of shooting scenarios. It features the same weather-resistant construction as the camera body to enable working in harsh environments and also has an SP coating to help repel dust, water, and grease on the front element. Its construction incorporates aspherical lens elements to help minimize spherical aberrations throughout the zoom range and also contribute to producing overall sharper, clearer imagery. Additionally, a Direct Current (DC) motor is utilized to provide quick, quiet, and smooth auto focusing that is well-suited to working with HD video recording. Multiple exposure shooting is possible in composite mode with additive, average, and bright settings for 2 to 2000 individual exposures. Native support is offered for both Pentax PEF and Adobe DNG 14-bit RAW file types. It is also possible to retrieve RAW data from JPEG files if still present in the camera's buffer memory. Scene modes: Portrait, Landscape, Macro, Moving Object, Night Scene Portrait, Sunset, Blue Sky, Forest, Night Scene, Night Scene HDR, Night Snap, Food, Pet, Kids, Surf & Snow, Backlight Silhouette, Candlelight, Stage Lighting, and Museum. Custom Image modes: Auto Select, Bright, Natural, Portrait, Landscape, Vibrant, Radiant, Muted, Flat, Bleach Bypass, Reversal Film, Monochrome, and Cross Processing. Digital Filters available during capture: Extract Color, Replace Color, Toy Camera, Retro, High Contrast, Shading, Invert Color, Unicolor Bold, and Bold Monochrome. Digital Filters available during playback: Base Parameter Adj, Extract Color, Replace Color, Toy Camera, Retro, High Contrast, Shading, Invert Color, Unicolor Bold, Bold Monochrome, Tone Expansion, Sketch, Water Color, Pastel, Posterization, Miniature, Soft, Starburst, Fish-eye, Slim, and Monochrome. Language support: English, French, Germany, Spanish, Portuguese, Italian, Dutch, Danish, Swedish, Finnish, Polish, Czech, Hungarian, Turkish, Greek, Russian, Korean, Traditional Chinese, Simplified Chinese, and Japanese. The 62mm 95-UVAT UV Filter is one of Chiaro’s highly-rated protective UV filters with 95% light transmission. It’s useful for photographers of all levels who demand high-quality glass and other essential features for great image fidelity and construction. To achieve 95% light transmission, Chiaro uses highly-polished optical glass, multi-coating, and additional advanced elements that improve the filter’s light transmission. A hard-anodized aluminum filter ring is designed to screw on and off effortlessly, and it’s thin to prevent vignetting when used with wide-angle lenses. Image quality is what matters most at Chiaro. The company has tested and combined many features and essentials to achieve superior image quality and the highest light transmission. To help take the confusion out of selecting a filter, Chiaro prominently displays the light transmission levels so you can choose the perfect filter for your lens and photo session. Protect your lens while maintaining optical quality. By using highly-polished optical glass, Chiaro offers a 95% transmission rate. And the company verifies the ratings with ISO certified lab testing. Highly-polished glass is essential to achieve a high level of light transmission. The optical glass in this Chiaro filter is polished for flatness that ensures great optical clarity. Top knurling is designed to offer a firm grip on the filter when you're attaching or removing it. Box Dimensions (LxWxH) 10.2 x 7.7 x 5.0"
K-70 DSLR Camera with 18-135mm Lens and Accessories Kit (Silver) is rated 5.0 out of 5 by 3. Rated 5 out of 5 by Jessica from So happy with Pentax As a former Pentax owner who had been shooting with Nikon for several years, I am EXTREMELY happy to have returned to the Pentax brand. I find the camera easy to handle, the menus and settings very intuitive and LOVE the images that the camera produces. This camera is easy for me to handle, even though it is larger and heavier than the K-x that I formerly owned. The auto focus is quick, and I dont care that it doesnt have 4 million auto focus points. The ones it has are quite effective. It seems like a great value for a camera / lens kit at this price. The 18-135 is very versatile and the next lens Ill add to my bag will be a prime for low light settings. I highly recommend the K-70. Rated 5 out of 5 by Zeep from Great camera, great price. I received a Pentax K-70 a few weeks ago, with the 18-135 kit lens. ?It is far exceeding my expectations. ?Takes awesome photos, which should be a given with a DSLR. ? Anti-shake stabilization is in the body, which means it works with about any Pentax lens. ?I've even used it with a couple of lenses built in ~1967, works great. ? The camera is rugged, and the controls are positioned well. ?You can customize the function of almost every button and knob on the camera, a feature I haven't fully explored because the stock settings work really well. After using the camera a few weeks I can't think of anything negative about it. ?If you're looking for a DSLR that takes fantastic photos, I'd recommend the K-70. I was also considering the Nikon D7500, D7200, and D5600. ?Glad I went with the K70, it's a great camera. Rated 5 out of 5 by Oleg from Great camera + okay lens at a great price. I own and shoot a few mirrorless from Fuji and Sony, but this time I was planning to go for a few weeks in a dusty desert and wanted to take a more rugged, weather resistant camera with me. After spending time researching I decided on the Pentax K-70 with a kit 18-135 lens. I also like this B&H's accessory kit, you are ready to go out and shoot the next moment after receiving it. Overall I think I made the right choice. The camera has a few quirks, but for the price it's hard to find a better offering, especially if you need something rugged and dependable. Pros: * Really solid high ISO performance. I shoot RAW and feel comfortable shooting up to 6400. * Built-in intervalometer and ability to produce 4K time lapse movies right in the camera. * Menus are logical and easy to navigate (unlike, say, Sony's). * Size, weight and ergonomics of the body - feels solid and good in my hands (but see one of the cons below). * Articulated screen is awesome. * Dedicated back focusing button. Cons: * The lens is just okay, fuzzy in the corners especially at wider apertures. And even stopped down to f/8, the center is still not quite sharp - see my attached comparison. I really think that this lens does not do the K-70 censor justice. * When shooting I tend to unintentionally hit the right D-pad button with the palm of my hand, which starts to mess with the drive mode or changes focus points. The workaround I found is to flip the screen over, which disables the D-pad. * Focusing system is quite outdated. I do not see this camera perform well at all when shooting moving subjects. * Batteries do not last. Better to buy a spare and have it with you all the time. How do you transfer photos to an ipad? Download the photos to an apple computer's Photos application. Then use iTunes to sync the iPad to the computer. Be sure to select Photos to be synced with the iPad. What type of battery does the standard package come with?